Naughty or nice? That is a question that is fairly common this time of year. But when it comes to fruitcake, maybe the question should be, “nasty or great”. You either love it, or hate it. I happen to like a good fruitcake. The challenge is that most aren’t that good. 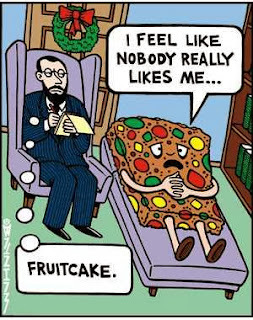 So what is it with fruitcake? 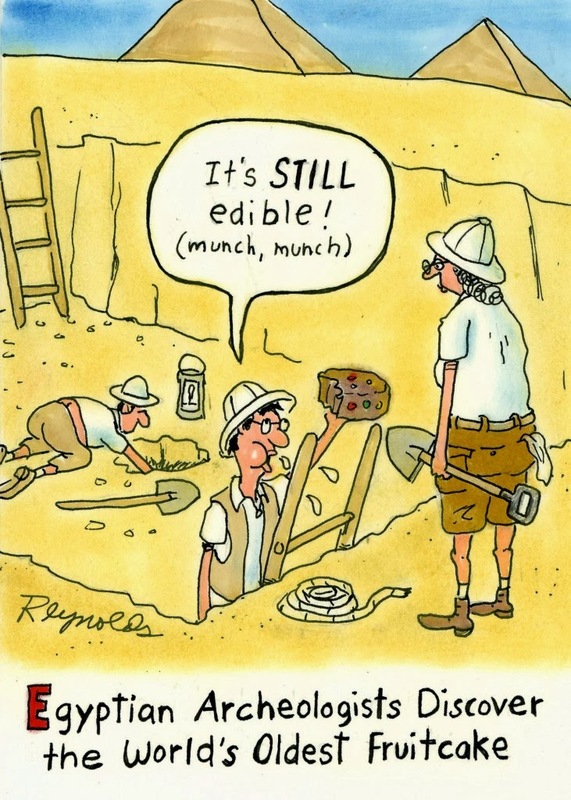 I can’t shed any new light on the history of fruitcake, but can recap what many other sources have already stated….It may date (pun intended) back to the early Egyptians, who placed fruitcake on the tombs of loved ones, possibly as food for the afterlife. But it really wasn’t that common until the time of the Romans, when “pomegranate seeds, pine nuts and barley mash were mixed together to form a ring-shaped dessert”. In the Middle Ages, preserved fruit, spices and honey were mixed in were popular with the crusaders. It was the English, however, who started the Christmas tradition. It was originally known as “plum porridge”, and it was eaten on Christmas Eve, as a mixture of oats and plums. 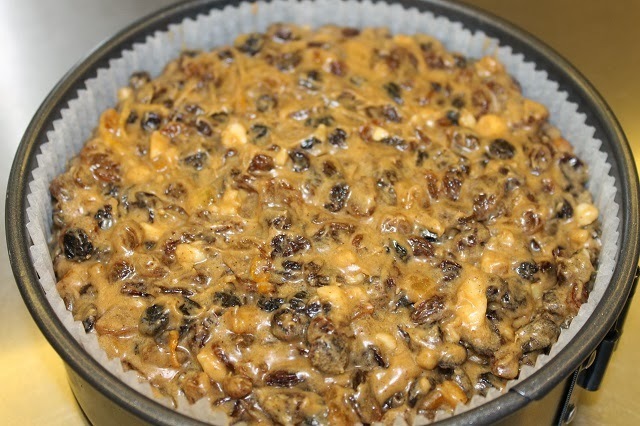 Soon, dried fruits, honey and spices were added and it was called “Christmas pudding”. Eventually, as the oats were removed, and replaced with cake, the name changed to "Christmas Cake", because the spices reminded people of the story about the Wise Men bringing exotic spices to the Christ child. Around this same time, people realized that fruit could be preserved, when soaked in large concentrations of sugar (the result of cheap sugar arriving in Europe from the New World). Not only the local fruits, but imported exotic fruits (citrus, pineapples, dates, pears) could now be used. While sugar makes for a decent preservative, alcohol might be even better. 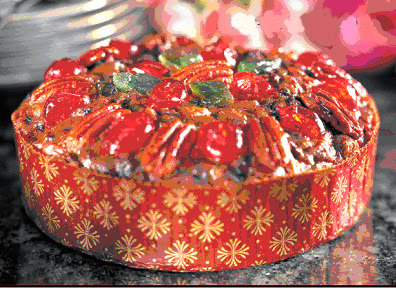 I remember the strong smell of brandy filling the air, when the fruitcake tin was opened. When I started looking for recipes, many did not include alcohol, but those that did, required being made well in advance of Christmas, then “fed” an amount of whiskey, brandy, or rum every few days. Some recipes required that an alcohol soaked cloth be wrapped around the cake. The alcohol would kill any potential bacteria from forming. Also, the earlier the cake is made, the more opportunity for the cake to develop and deepen its’ flavors. Just like wine, preserved fruit also has tannins that are released into the cake, adding complexity. The alcohol also counteracts the sweetness of the candied fruit. When it comes to alcohol and fermented spirits, Monks are the experts. The best known “monk-made fruitcakes” comes from the Trappist monks at the Abbey of Gethsemani near Louisville, Kentucky. Another is produced by monks at the Holy Cross Abbey in Berryville, Virginia. Their brochure describes the fruitcake as follows, "The Brothers add a generous measure of fine sherry wine. After slow and gentle baking, each cake is laced with traditional brandy and topped with a honey glaze." I’ve made numerous fruitcakes over the years, some better than others. The best one was found in the Bon Appetit magazine back in the 80’s. For the life of me, I cannot find that recipe. I have searched the internet, as well as my recipe shelf. No luck. This year, I have started making the White House Fruitcake Recipe. The large bowl of fruit is soaking in Tennessee Whiskey and Cognac (yes, as with any cooking, always use the best ingredients). Since this is a wine blog, I would be remiss if I didn’t offer a few wines that might pair well with a fruitcake. The most obvious would be to pair with the type of alcohol that the cake had been soaked in (assuming it was one of those types of cakes). Some other possible pairings would be Moscato (with its’ fruit-forward flavors of grapes, peaches and apricot); Tawny Port (with oxidized flavors of almond, spice and caramel); Sweet Riesling (peach and orange blossom); or maybe even a Rutherglen “stickie” from Australia, or an Italian Bracchetto d’Aqui; and finally, an off-dry sparkling wine. If you are a regular follower of this wine blog, you know that I am always looking for an excuse to do wine pairing dinners. I really enjoy themed dinners, but occasionally, opportunities present themselves to try something different. This week, a small group of us got together to taste a four year vertical of Paul Dolan Zinfandel. I must admit, I was not familiar with this winery. They are an organic/biodynamic winery out of Mendocino County, in Northern California. We were able to pick up the 2006, 2007, 2008, and 2009 Zinfandels. Each wine was opened about an hour before our dinner, and allowed to breath. Each couple brought one course for the dinner, and there were four couples total. The menu consisted of an opening Caprese "style" salad. I say, "style" because, not only did it have tomatoes, basil, and cheese, but it also had avocado, and the cheese was a homemade cheese, which followed a traditional Croatian recipe. Why Croatian? Because it is thought that the Zinfandel grape originated in Croatia. The main course was a Beef Bourguignon, following the Julia Child's recipe, and side dish of scalloped potatoes. My responsibility was the dessert. I like to experiment, so I made a blackberry Panna Cotta, topped with fresh blackberries and bittersweet chocolate shavings. I also made figs, poached in Zinfandel. The poaching liquid was later reduced to a syrup, and the figs with syrup were poured over vanilla ice cream. All four wines were poured, and set in front of each place setting. The first noticeable difference was the color of each vintage. The '06 and '07 vintages were visibly lighter than the '08 and '09. My process of tasting verticals (particularly with food) is to look at each wine in the glass, smell, then swirl and smell, then taste. After that first taste, I taste again, then take a bite of food, and taste wine again, to see how it changes with the food. The 2006 Paul Dolan Zinfandel was the only vintage that had grapes from two growing regions. While all the vintages had grapes from Mendocino, the 2006 had grapes also sourced from Amador County. As mentioned, the 2006 vintage was lighter in color. It was fairly light bodied (for a Zinfandel). The alcohol level in all four wines as the same, coming in at 14.5% (again, low for a high sugar grape, like Zinfandel). The '06 vintage still had some fruit to it, but there was also some herbs on the nose. On the palate, the wine had some peppery notes, very light fruit, and moderate acidity. The most interesting thing about this wine, was how it changed in the glass over time. Most of the food overpowered this lighter Zin. But, by itself, I found it a nice drinking wine, particularly at under $20/bottle. I wouldn't run out and purchase this vintage, as it is already showing its' age. The 2007 Paul Dolan Zinfandel was also light in pigment, and was by far the lightest on the palate. But, I found this vintage to be my favorite overall. It had the most complex nose of all four. There was some blackberry and cherry fruit, mixes with herbs, and bit of tobacco or leather. As with the 2006, this vintage was a bit light for the food (it couldn't hold up to the vinaigrette on the salad, or the richness of the beef). Of the four, this was my favorite...maybe not for pairing with food, but as a nice drinking wine. The 2008 Paul Dolan was a dark ruby colored wine, and had mixed reviews. One person in our group picked this as his favorite, while most did not care for it at all. I am almost wondering if there might have been something wrong with the wine, as it was the only one in the vertical, that was purchased from a different retailer. There was a strong bacon smell to the wine. It was also the most "jammy" of the four. There also seemed to be a lot of oak on the nose, and a mushroomy character to the wine. This was my least favorite vintage of the four. Finally, the 2009 Paul Dolan Zinfandel was also very dark in color, and was had the heaviest body of the four. The weight of the wine made it the best for pairing with the meal...even up against the vinaigrette dressing on the salad. There was lots of black fruit and spices on the nose, making this more of a "jammy" wine. But, the fruit wasn't overpowering, there was a nice balance in all the components. Of the four vintages, this one tasted the most like what you expect from a Zinfandel. As I said, I made the two desserts. Not knowing what the flavor profile of the wines was going to be, I made one with limited sweetness (blackberry panna cotta) and one with a Zinfandel syrup (poached figs). Remember you always want your wine to be sweeter than the dessert. Neither really worked, so we opened up a bottle of California Port, and called it a nice end to the evening. I hope this will inspire you to try your own vertical wine tasting. sometimes they work, sometimes they don't. But at least you get to drink wines, and get together with friends. And, isn't that what it is ultimately all about? You can tell the holiday season is upon us, just by the amount of Christmas commercials on television, as well as the re-runs of old Christmas shows. This week, I watched an interesting show on the History Channel about where our holiday traditions came from, and it got me thinking about traditional holiday drinks. Last year, I did a blog about mulled wine, and the previous year, I did one about the origins of eggnog. So this year, I went into the archives, and did some digging. Are you familiar with Sack Posset? “Sack what?” you say? Sack Posset was a popular, custard-like drink of Elizabethan England. That may be the nice way of putting it. Since many in the population of that time, were of lesser means, Sack Posset was more of a curdled milk and wine/beer concoction. It went out of style about 200 years ago, but a newer recipe I was able to find, may revive this once popular drink. First, where did the name come from? “Sack” is a common old English term used to refer to a fortified wine. It may have come from the Latin, ‘siccus’ meaning dry or harsh. But, not all fortified wines are dry and harsh. You may be familiar with Dry Sack Sherry (which can be harsh). This is a dry, fortified wine from the Sherry (Jerez) region of Spain. Since “sack” can refer to any fortified wine, we can assume Sherry, Madiera, or even Port could be used as an ingredient. 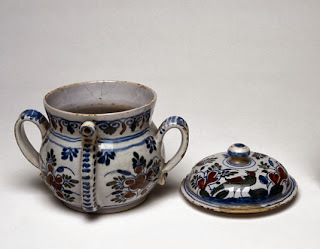 The word, “posset” used to refer to a small pot or saucepan. Today, a posset is a type of small pot. They have large bodies, lids and usually, two handles. There is a spout at the front that was not used for pouring, but for actually sucking out the liquor. The remaining curds were eaten with a spoon. 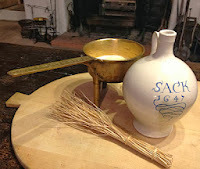 Sack Posset was made from various recipes. Originally, it appears to have been for medicinal use. But by the 17th Century, it became more popular as an actual beverage. Also, remember that hygiene, pasteurization, etc, were not known at this time, so alcohol was the way to kill germs. 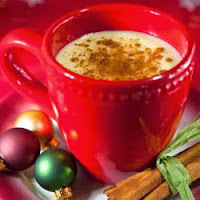 Sack Posset typically featured spiced, warm wine mixed with milk, or cream. The milk would curdle and float to the top. So you would drink the wine from the bottom, then eat the sweet curds that floated to the top. Take a pottle of Cream, and boil in it a little whole Cinnamon, and three or four flakes of Mace. To this proportion of Cream put in eighteen yolks of eggs, and eight of the whites; a pint of Sack; beat your eggs very well, and then mingle them with your Sack. Put in three quarters of a pound of Sugar into the Wine and Eggs, with a Nutmeg grated, and a little beaten Cinnamon; set the Bason on the fire with the Wine and Eggs, and let it be hot. Then put in the Cream boiling from the fire, pour it on high, but stir it not; cover it with a dish, and when it is settlede, strew on the top a little fine Sugar mingled with three grains of Ambergreece, and one grain of Musk, and serve it up. Put the egg yolks, egg whites, sherry and spices into a large mixing bowl and whisk until they are well blended. Place the bowl over a saucepan of gently boiling water and stir until warm. Take care not to let the egg mixture overheat or it will scramble. Reserving 1 teaspoon of the caster sugar, heat the remainder with the cream in a saucepan until it rises to the boil. Pour the cream mixture immediately, in a steady stream from a height, onto the egg mixture, whisking as you pour to make it frothy. Leave the posset to stand in a warm place for 5 minutes, then sprinkle the reserved sugar and a little nutmeg over the surface and serve in heatproof glasses. This drink goes well with mince pies and, because it is rich, one glass per person should be sufficient. So, try something different this holiday. Make some mulled wine, or homemade eggnog….or if you are really adventurous, make some Sack Posset, and share the history with your friends.